As a child of the ‘70s, some of my most vivid memories are rooted in the annual road trips my family took up and down the Eastern seaboard of the United States. With a trailer in tow, the Coopee clan of seven hopped in our automobile du jour and hit the open road for “parts unknown” (at least, that’s what it felt like to me at the time). While we traveled, I was typically nestled in the seat-belt-free “third seat” of the vehicle, passing time with a myriad of Invisible Ink books, Mad Libs, one or more of the latest Hardy Boys adventures, and that random Cracker Barrel Peg Game I could never quite master. EVERYTHING changed in 1979 however, when Merlin – The Electronic Wizard accompanied me on our journey to Daytona Beach, Florida. Instead of silently marveling at Frank and Joe Hardy’s sleuthing abilities, I was now able to use one of Merlin’s built-in games, Music Machine, to program and repeatedly broadcast riveting computerized renditions of Auld Lang Syne, London Bridge, and Shenandoah – clearly a win-win for me and my entire family! Little did I know at the time, Parker Brothers’ Merlin was well on its way to becoming a top-selling toy in the U.S. Merlin – along with rival toy, Simon, from toymaker Milton Bradley – would help pave the way for a wave of new handheld/portable electronic games. Operating on 6 AA batteries, Merlin’s “intelligence” was facilitated through a small microprocessor that was programmed to play five different math and memory games, as well as the aforementioned Music Machine. The idea of embedding programmable electronics into a game like Merlin was novel for the time – primarily because up until the mid 1970s, logic chips were far too expensive to consider incorporating as part of a mass-produced toy. By the time Merlin was introduced at the New York Toy Fair in 1978, its TMS-1100 chip from Texas Instruments was costing Parker Brothers well under $1.00 each, a mere fraction of the toy’s $24.95 retail list price. Merlin was co-invented by Bob Doyle and his wife, Holly Thomis Doyle, both Havard-trained astrophysicists. Seeing the potential of electronic gaming, the duo formed a game development company called Micro-Cosmos in 1975 with Holly’s brother Wendl Thomis. In addition to Merlin, Micro-Cosmos developed over 20 game prototypes, publishing several of them through Parker Brothers, including two of my favorites: P.E.G.S and Code Name: Sector. Merlin’s design patent reflects the period in which the toy was released. 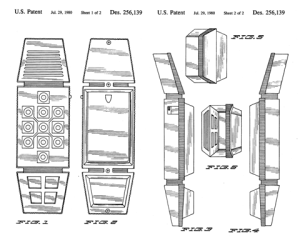 The drawing resembles a modular, trim-line telephone handset with a heavy influence of “droid” from Star Wars. In addition to form, the chosen color for the toy, red, helped it further stand out in a crowd. Samuel Kjellman, one of the three inventors listed on the patent and a staff designer at Parker Brothers, created the design. He outfitted Merlin with an 11-key touchpad, and each button was illuminated with an individual LED light. The area below the touchpad housed four buttons that allowed the user to select one of Merlin’s games while the top of the device contained a speaker. According to news reports of the time, children’s play test groups reacted favorably to the design, but it was Merlin’s robotic voice that really “…anthropomorphized Merlin in a way the design couldn’t”, according to Kjellman. 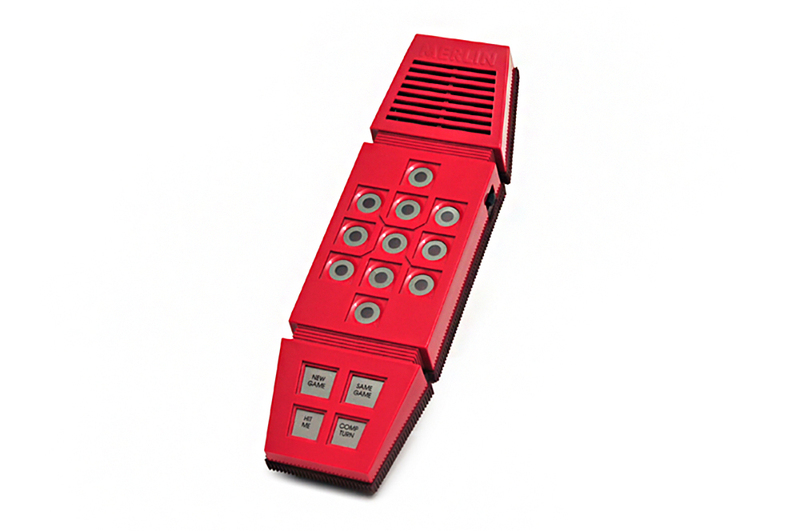 Merlin was a run-away hit for Parker Brothers with over 5.5 million units sold during the toy’s initial release, which ended in the mid 1980s. The company attempted to leverage Merlin’s success by releasing several follow-up toys, including Split Second in 1980 and Master Merlin in 1982. In 1995, Parker Brothers once again redesigned Merlin, releasing Merlin: The 10th Quest. This version included nine games, all with a fantasy-theme. Finally, Milton Bradley re-released a slightly smaller version of the original game in 2003. The re-released toy was eventually discontinued, but road trips continue to be noisy adventures with handheld electronics and smart phones picking up the slack. It’s pinball-inspired target practice with The Junk Yard Game from Ideal. Billed in a $1,000,000 advertising campaign as "the toy that makes toys", Parker Brothers' Riviton construction system hit the market with impact in 1977.